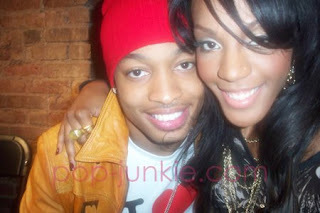 No, for the 10% of you who might care, Dawn and "Q" from MTV's Making the Band 4 did not break up. I do not want my title and picture to be misleading. My own little tender heart is damaged - damaged from the MTB series. No longer are the days of Danity Kane. Sure, they have tried to tease us by showing us clips with all of the DK girls for the 4th series . . but the jig is up! This fourth series has been nothing more than a bunch of whining, and I for one have had it! Each episode has become more and more of let's see how many ridiculous hats the boys of Day 26 can wear than any significant talent! And the leading "lone" (okay, Aundrea is there too) soldier of DK, Dawn, seems like the only word that comes out of her mouth is "hustlin". Therefore, Making the Band, I am breaking up with you. My readers, this is why you will not see me post any blogs about this show - a show that used to be great, but now is nothing more than an old wrinkled up picture in my sock drawer (if you all cared about it anyways). And for old times sake, I give you a link to click on if you wanna reminice about the days when MTB and I used to go on ice cream dates, our honeymoon period, when it was a shiny sparkly play thing in my eyes, when it was "move your body shake your body gettin naugh-tay naugh-tay" and when Aundrea was just a little muff and when I wanted hair and scarves just like Aubrey O'Day . . the days, my friends, when Making the Band was great!